Click HERE or on the addresses below for directions to the venue. 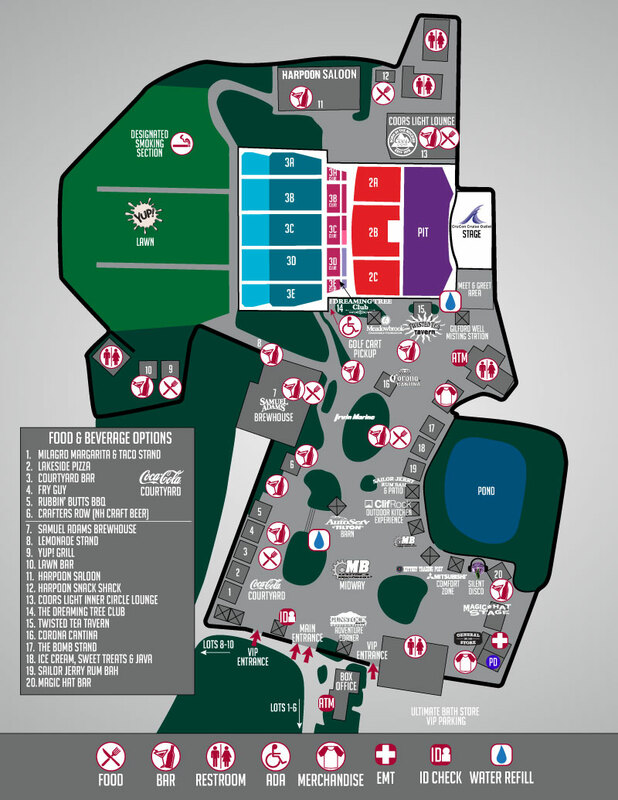 Please be sure to note if you need to come in the West Entrance (Tenting passes) or the Main Entrance (Standard Parking Passes). -Must use the West Entrance Only (150 Kimball Rd. Gilford, NH). -2-Day Camping Passes include overnight parking for the weekend. -Single Day Camping passes include overnight parking for the day of their pass. -Campers must come through for full inspection between 10:00 AM and 7:00 PM on Friday, September 15th. -All vehicles with a camping or overnight pass will be searched for glass, pets, kegs, fireworks, contraband, weapons, drugs, nitrous, and illegal substances (see below for a list of approved and prohibited items). Each vehicle will be issued a special parking pass after passing inspection and all patrons (up to four per tenting pass) in the vehicle will receive a special wristband for access to the tenting areas. -Only patrons with camping wristbands will be allowed into the tenting areas. -No extra vehicles will be allowed to park overnight. If overnight parking is required for your vehicle, you must get a 2-day camping pass. -You must depart by Noon on the day after your pass (Saturday 9/16 for Friday only passes, Sunday 9/17 for Saturday and 2-day passes). -We are allowing two total vehicle re-entries per camping vehicle. Should you choose to explore the local area, grab camping supplies, etc., you must re-enter the property between 10:00 AM and 4:00 PM on either day. All vehicles are subject to full search again upon re-entry. -You can pay for parking upon arrival for $10 but in cash only please. -May arrive beginning at 3:00 PM. -Will be required to vacate the parking area by 2:00 AM. Unclaimed vehicles will be towed beginning at this time. -There will be NO same-day parking re-entry for standard parking passes. It is important to stay hydrated and drink water! In addition to bottled water available for purchase (both inside the venue and camping areas), there will be a couple free water stations in the event grounds. Please bring a CLEAR, EMPTY re-usable water bottle up to one liter in size, or an EMPTY Camelback to fill up and stay hydrated inside the venue. We also allow ONE, factory sealed 20-oz. water bottle per person into the venue. See the map below for water filling locations in the Midway. There will also be water filling stations located in Lot 2 near the camping bathrooms and at the Well House across from the VIP West lot. There will be NO same-day Re-Entry to the venue between when doors open at 4:00 PM and 11:00 PM. Please remember to bring everything you need from your car or your campsite. Friday AND Saturday from 11:00 PM - 2:00 AM Lakeside Pizza, Rubbin' Butts and Fry Guy will be open with full menus. Absolutely NO bags are allowed in the Midway upon re-entry during these "Free Pass" times. Our current bag policy will be in place for this festival. This means no bags larger than a small 5.5" x 8.5" clutch, with the exception of CLEAR totes no larger than 12" x 6" x 12" can be brought into the venue. The only exceptions to this policy for this festival are an EMPTY Camelback, and a fanny pack which like all other bags, will be searched upon entry to the venue. This bag policy does NOT apply to our parking lot or camping areas. Larger bags are allowed in the camping and parking areas. If you have a two-day pass, you will need your ticket for entry to the venue on BOTH DAYS, so do not throw it away after it is scanned on the first day. If at any point over the two days you lose your ticket, we CANNOT re-print it for you. We encourage you to save your ticket on your phone. For the comfort of all campers, we have a limited camping capacity so we encourage everyone to buy camping in advance. Camping is sold by site - each site holds up to four people with a tent, no larger than 10x10 feet. Each camping pass includes parking for one vehicle. Your vehicle will be parked in one area and your tent will be in another. All tents will be together, away from any vehicles. Please do not bring anything that you know is not permitted or anything that could possibly be construed as a weapon (baseball bats, sharp tools, large knives, hatchets, hammers, etc.). 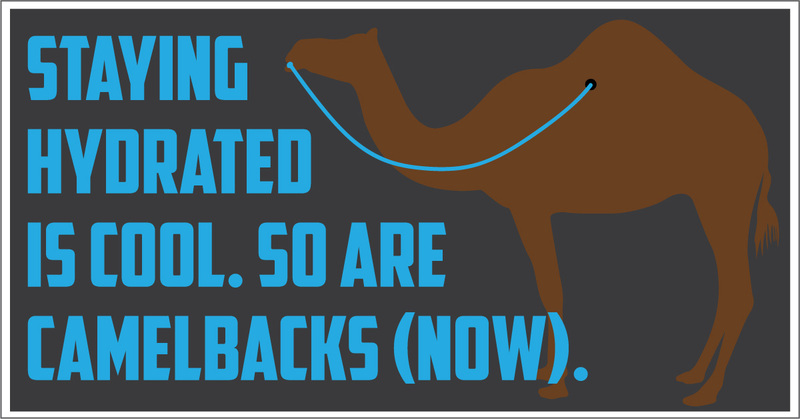 Not only does it put an unnecessary strain on our staff and resources, but it also holds up the line for everybody behind you. We encourage you to arrive as early as you can after camping opens. Please remember that getting everyone in is a pretty monumental task, so let's work together for the good of the whole and do what we each can to make the process go as smoothly as possible. Pets of any size - We love animals, but a festival is no place for them, so please leave all critters at home. Leaving a pet in an unattended vehicle, even with the windows open, will not be permitted. Service dogs must be licensed AND be wearing the appropriate apparel clearly identifying them as an active service dog. Prescription Drugs: We will only allow quantities appropriate only for the timeframe of the festival as required by the directions on the prescription in the bottle, contained only in the original prescription bottle and held by the named individual in the prescription with a matching photo ID. The consumption of alcohol in the parking or camping areas violates a local ordinance. 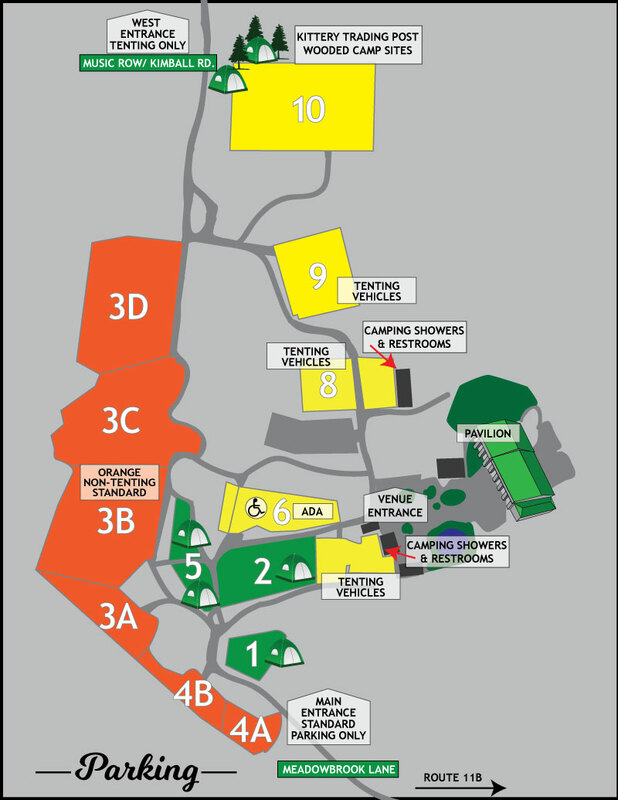 Please contact guest services for information regarding vehicle searches upon entry into the camping areas. See our policies page for more information regarding alcohol consumption once inside the venue. In addition to tents, tarps, chairs, food and everything listed above, the following items are recommended and will make your weekend more enjoyable: Extra toilet paper, a flashlight, extra trash bags, portable radio, small luggage lock for your tent, rain gear, sunblock. Remember to leave all your valuables at home! Promoter is not responsible for lost or stolen items. Coolers and food from outside the festival are only allowed in the campgrounds. Propane cook stoves will be permitted in the camping area. Mobile Ice & Water Vendors - to keep you hydrated at your tent and your coolers cold! Please be responsible and keep campsites clean! Use trash and recycling receptacles correctly. It is imperative for campers to embrace "Leave No Trace" camping practices. We have at least one recycling and trash bin in each camping location. Clean up your campsite daily rather than all at once or the bins will become overfilled and our staff overwhelmed. If you have any questions please ask a staff member. Thanks for your help! We ask that you please respect your neighbors between 2:00 AM and 10:00 AM in terms of noise. For more information, please email, chat with us on the website or call the box office at (603)293-4700.